ALL INDIA U-19 FOOTBALL TOURNAMENT AT KALNA BURDWAN PARTICIPATING 5 I-LEAGUE TEAMS WITH OTHER 7 TOP INDIAN TEAMS . KALNA SUPER SOCCER CLUB, BURDWAN is going to organise the 12 teams ALL INDIA FOOTBALL ACADEMY U-19 FOOTBALL TOURNAMENT in first week of Janyary 2013. The opeing ceremony will be held on 6th January and the tournament will be played from 7th January and the final will be hld on 13th January. Football is a source of spirit and a essential commodity for the daily survival of the people of West Bengal. From the urban to rural area picture remains the same for the football oriented Bengalis. The year ending annual programme often takes the shape of an exciting football tournament in numerous part of cities and villages alike here in West Bengal. The same initiative has been taken up by the Kalna Supper Soccer Club Kalna, Burdwan as they are set to host an All India Football Academy U-19 Football Tournament to vogue a new sense of grassroot rivalry in the diet of the football fanatic Bengalis. This would be their 2nd Edition of Jr. Level Tournament as they organised last year U-17. The same club is also famous for being the brainchild behind the success of another famous tournament taking part in the area named as the Kalna Independent Gold Cup Football Tournament incepted in the footballing calendar back in 2009. The Kalna Supper Soccer club has a legacy of its own in maintaing the footballing diet of the football hungry Bengalis. They have seven free football coaching centres in Kalna Su-division of Burdwan to attract the youth in making serious efforts being a part of this beautiful game have already 650 members under their repertoire and to add to that a stadium is also constructed with a capacity of 15000 which marks the depth of passion that surrounds the club and the district. The Kalna Independent Gold Cup tournament is a souvenir of the initiative taken up by the club with a token of spirit reflected by them. Mr. Subir Ghosh, the mentor of the club as well as a former Indian National Footballer ( who played for East Bengal, Mohun Bagan, Mohammedan Sporting) and also represented India Sr. football Team for 8 times, played Santosh Trophy 3 times for Bengal) told us that, the start of this All India basis U-19 tournament will be on 6th January 2013 at Kalna Agornatch Football Stadium. They will try to schedule the final on 13th of January. The whole tournament will be playing in the three seperate fields of Kalna including Aghorenath Stadium of Kalna. Subir Ghosh also told that some famous Football Academies of India will take part in the 12 team based Tournament where Winners Prize will be 25000/- and Runners up Prize Money will be 15000/- . Mr. Ghosh told us the following teams has confirmd them to participate in the tournaments. There will be the ticked system in the Stadium to watch the match. The teams East Bengal U-19, United SC U-19, United Sikkim U-19, Air India U-19, Shillong XI, Mohammedan SC U-19, IFA Football Academy, G-Group U-19 FA, Sir Dikhuram Mazumder Coaching Centre U-19, Bidhan Nagar Municipal Academy U-19, Bokaro Steel FA U-19 and home team Kalna Super Soccer U-19. Prize money will be awarded to the justified winners and runners up with prizes also announced in other categories also. The sponsorship hackle is soon to be solved with the club having already sorted out their web partner to give their thumbs up in such a noble initiative that would help in maintaining the footballing tradition of the Bengalis. AIFF I-LEAGUE : ANALYSIS UPTO 13TH ROUND. So the curtains comes down on the first phase of numero uno competition of Indian Football, I-League. As usual two Goan Clubs of Goa, Churchill Brothers and Dempo sports Club, are close at heels for the coveted place of number one. They are keenly followed by a Club from Maharashtra, namely Pune FC and a club from Kolkata, East Bengal. But surprisingly two times winners of the tournaments, a goan club, Salgaokar, is inching towards the place of wooden spoon winner and more surprisingly more than a century old club, MohunBagan, with millions of mass support, may be just waiting to play 2nd division in coming season due to 2 years ban from AIFF for 9th Dec, Kolkata Derby controversy. INDIVIDUAL HIGHEST GOAL - RANTI MARTINS - 5. HIGHEST WIN IN GOAL DIFFERENCE: UNITED SC 10-1 UNITED SIKKIM. Last years champion Dempo Sports Club of Goa are as usual posed them as a front runners for winning the championship for 6th time, but still now they are quite Scrapy in their outings. Dempo sans Ranty Martin is quite lackluster in their approach. Their two big defeats against lowly placed ONGC and upcoming PUNE FC and a draw againt Mumbai FC in 13th Round, have got enough sign of their fragile defense. On the otherhand Churchil Brothers under guidasnce of experienced TD Subhash Bhowmick, running Neck to neck with Dempo, are quite impressive in their approach. Under the steward Leadership TD Subhas Bhowmik, they play quite impressive football except in two Matches against Dempo and East Bengal, where they have to bear the burden of two Ignominious defeats. 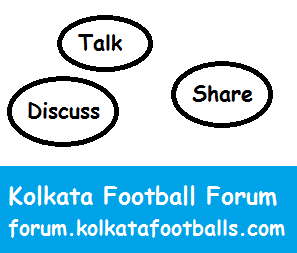 For East Bengal, a Calcutta giant, the story is like last two years. Under the excellent guidance of British Coach Trevor Gemes Morgan, they achieved a certain standard in their game execution. But yet to achieve their ultimate goal. Main reason for their failure to reach the top is to convert the available opportunities into goals. Conceeding only 4 goals in 12 matches, gives enough proof of their defensive strength. LOWEST POINT EARNER : UNITED SIKKIM - 9 POINTS. LOWEST TIMES MAN OF THE MATCH AWARD : AIR INDIA AND SALGAOCAR - 3 AND 2 TIMES. LESS GOAL CONCEDED TEAM : EAST BENGAL - 4 GOALS. In fact Pune FC is closely following the league leaders. They have got a balanced side and can cause any upset at any moment of the tournament. But as the tournament progresses Pune FC slowly but steadily improving their position in the chart of I-League contestants under Derrick Pereira. At the end of the first phase of the tournament, a team build With future probables of Indian Football, Pailan Arrows, played quite stunning football. Aurther Papas, their Australian Coach,instills enough confidence in their approach. But For Kolkata fans, United SC is quite disappointing one. With Ranty Martins, Carlos Harnandez, Bellow Rasaq, Gourmangi Singh in their ranks, they fail to display that level of soccer which Was expected from them. Last but not the least is shocking performance of three times winners of National Football league as well as endowed with the glorious history of Indian Soccer, Mohun Bagan. They failed every sphere of the game. Last nail in their coffin was put when they refused to continue the match against East Bengal on 9th Dec. After halftime. Absence of Mohunbagan in the I-league is quite painful one as it reduces The competitiveness of the tournament in many ways. Absence of Okole Odafa and Tolge Ozabe - will cause a major shock to the football lovers of the country. MOST RED CARDS : ONGC, UNITED SIKKIM AND SPORTING GOA - 2 TIMES EACH. HIGHEST TIMES YELLOW CARD IN INDIVIDUAL - ADEOLA (FOREIGNER) - MUMBAI FC 5 TIMES. Looking at the history of this tournament, it is quite difficult to Predict the ultimate winners of the tournament. But considering the performances in the First phase of the I-league, any teams from the first four teams can win the ultimate championship. But it all depends on how the reserve bench and foreigners of these teams Show their mettle in the last lap of the tournament. For Kolkata club it is quite a tuff one. Going through the different matches of I-league expectant. Churchil Brothers Of Goa, it appears. Verteran Brazilian midfielder Beto is well Supported by Akram Mograbi in attack and in defense Bellal played a very Constructive roll. Last years champion Dempo Sports club of Goa, even if they are also In the hunt for the coveted championship,is quite patchy in their performances. Injury to Mahesh Gawli, Ruiji Syuoka, Koko Sakibo is causing enough problem to keep Their flag flying in different matches. Suspension of Armando Colaco, Climax Lorence And internal feud with Rohan Rickets are bringing impediment in their smooth sailing. On the otherhand,Pune FC is gaining their ground in the race for the ultimate Goal. James Moga and Jeje Lalpekluha are doing their job with consummate ease. Only challenge from Calcutta is coming from Kingfisher East Bengal Club. They Are suffering from erratic display of their attacking line. As their main striker Edde Chiddi is not properly supported by Robin Singh or Manandeep Singh, other two strikers, their goal scoring ability is plummeted distinctly. They now feel the absence of another foreign striker in the team.Only time will say Andrew Borisic of Australia is capable of fulfilling the void or not. For the ultimate result we have to wait for atleast another four months.We soccer lovers of India is eagerly waiting for it.